Early this year TropicalBass, Mad Decent and Latino Resiste among many more websites released a Free compilation made by Mexican Underground leading blog Bootlegumachine n LR, called AZTLAN. That release dropped some of the most innovative sounds from Mexico, including 2 songs from 3ball biggest names: Erick Rincon and Sheeqo Beat; who are part of 3ball MTY with their partner in crime DJ Otto. Now, 3ball huarachero, has certainly broken the underground barrier, and slowly is getting attention from Mainstream Media in Mexico, and even though their music is highly appreciated, it is very polarized as it is still considered very ghetto.. Specially because the pointy boots (botas picudas). A new generation of producers are following the path created by Dj Mouse, Ric Reyna, Alan Rosales, and later on Erick, Sheeqo and Otto aka 3BALL MTY. This is an effort; trying to show and unveil some of these names for a “non-mexican underground” scene, some people who have been on the game since it started and for some reason are still “unknown”, even for Mexican public. Latino Resiste, releases a FREE COMPILATION called 3BALL PREHISPANICO, in where you will find some of the whole variety of 3ball huarachero AND prehispanic. Now.. Like what happened with the earliest stage of reaggetton or Moombahton; Tribal used to have a very repetitive pattern, usually a 4/4 and beats btw 120 and 130 bpm..
Dj Mouse, Rosales, 3TS, Reyna are the pionners of that sound. Until the new kings arrived….Erick, and Javier Estrada worked together in 2006, but then Sheeqo Beat came into the scene and started working with Erick on what we now know 3ball MTY. Obviously having their own background and influences which altered and polarized the tribal scene, not only in MX but also it made it more accessible for global bass ears, although at the same time, it sent a HUGE portion of tribal even more underground. How did you guys started in tribal? Erick Rincon: Before 3ball gurchero, Sheeqo Beat and I produced electro-house and latin-House. Do you guys think you have a certain “style” different than the other 3ball Dj’s? Sheeqo loves Latin stuff, specially latin house. Otto loves Dutch-house and Minimal house. I am more of an Electro and cumbianchero (cumbia lover). How did you started doing 3ball? Erick: Sheeqo and I, were not doing so well with electro-house, besides it was impossible not to dig 3ball..every time we went to some friend’s party 3ball was there!! So when we arrived home we came with tons of 3ball ideas, we did keep the synth and loops, just that we wanted to have a different base, more cumbiambera, heavier basslines, tropical congas, guarachas and shakers!!! So 3ball obviously has a different perception from the public in Europe, North America and Mexico. 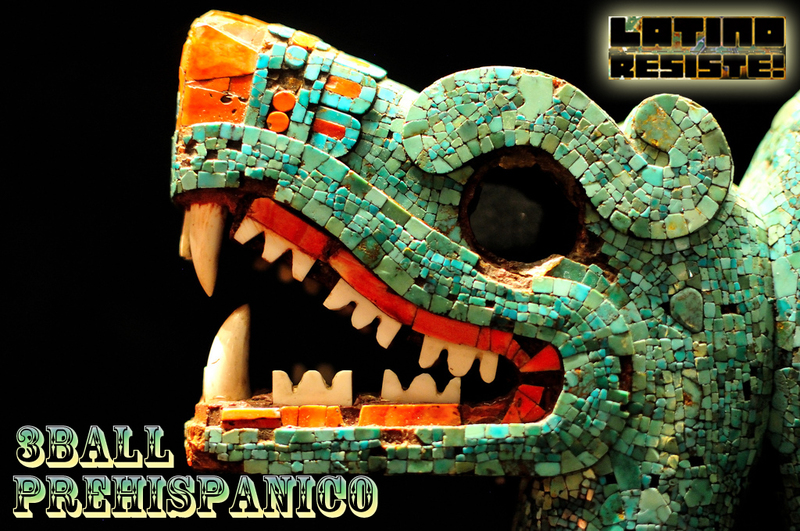 and it has a Sheeqo Beat vibe on it..
What is the Mexican perception about tribal guarachero? Sheeqo Beat: Tribal guarachero here in my town, is “suited” by certain people, it is for lower class people or kids, although most of the people still find it disgusting! However, people are different everywhere,European Public is more open, but even now here in Mexico we have played in many places that never played huarachero and people who were there loved 3BALL ! and they were all adults!! One of the things I like most is that we have always handled the 3ball for people who are underage, or very young, they are between 12 to 16 years old, but this genre is slowly getting more respected from older crowds and that’s what excites me!, I think gradually Guarachero and 3ball will be more enjoyable for people who think that it is a genre that should have never existed. Dj Tamalero, Tetris, Alan Pina,Ezekiel, Lao, Dj Rooy, among others will show this new blood and second generation of 3ball who are following Rincon’s and MTYsteps. Even Den5hion is doing a Dj Otto 3ball/dubstep approach! !